The Stage Size and the Dimensions - The Dimensions of the Globe stage cannot be specified. 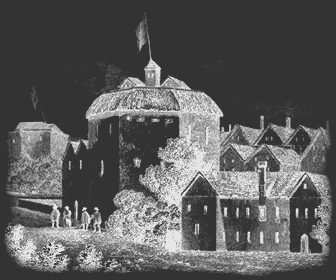 Stage dimensions of Elizabethan theaters varied from 20 foot wide 15 foot deep to 45 feet to 30 feet . The stage was raised - 3 to 5 feet and supported by large pillars. The Pit, the Yard, the Galleries - The Pit, or yard, was the area located around the stage. There was no seating - the cheapest part of the Globe Theater and the audience had to stand. The stage structure projected halfway into the ' yard ' where the commoners (groundlings) paid 1 penny to stand to watch the play. They would have crowded around the 3 sides of the stage structure. The crest and motto of the Globe Theatre Above the main entrance of the Globe was a crest displaying Hercules bearing the globe on his shoulders together with the motto "Totus mundus agit histrionem" (the whole world is a playhouse). This phrase was slightly re-worded in the William Shakespeare play As You Like It - "All the world’s a stage". Who built the theater? What was the structure like? What building materials were used? How long did the theater take to build? Who financed the the building of the theater? What were the amenities like? How big were the grounds and what entertainment was available? The Builders of the Globe - The Globe was built by carpenter Peter Smith and his workers and was the most magnificent theater that London had ever seen. It was built between 1597 -1598. Toilets - None. People relieved themselves outside. Sewage was buried in pits or disposed of in the River Thames. The Grounds of the theatre were filled with stalls selling a variety of take-away foods and beverages. The Globe theatre was also used for gambling and prostitutes plied their trade within the confines of the Globe building and grounds. Fights also broke out amongst audience members adding to the enetertainment available. Details, facts and information about the Globe Theatre Design and Structure in the Elizabethan Theatre can be accessed via the Elizabethan Era Sitemap.